To install or change the language in Windows 8.1 / 10 is a very important key feature in Win 8.1 and 8! Here is a clear solution to show how to solve the problem! It is a very important and practical option in Windows 8.1, as well as under Microsoft's Windows Server 2012 and 2008, it is now also possible to quickly install additional national languages ​​on the tablet PC and desktop PC and also to quickly change them. 1.) ... Add and remove languages ​​in Windows 8.1 and 8! 2.) ... Set a primary language as the display language in Win 8.1 and Eight! See also: ► Desktop shortcut for Excel, Outlook, Word 2013! 1.) Add and remove languages ​​in Windows 8.1 and 8! control.exe /name Microsoft.Language (... See Image-1 Arrow-2). Likewise, you can open the Windows-8 language settings (Image-1) via the "Control Panel"
See: ... Open (call, start) Control Panel In Windows 8.1/8! and then click the icon (symbol) "languages". Now you can install other Windows-8 and 8.1 language ( ... See Image-1 Arrow-1 ). Move after installing the required language to the first position ( ... See Image-1 Arrow-3 ). Likewise, by clicking "Remove" you can uninstall unneeded languages from Windows-8. On this point, you can also change the Keyboard layout! 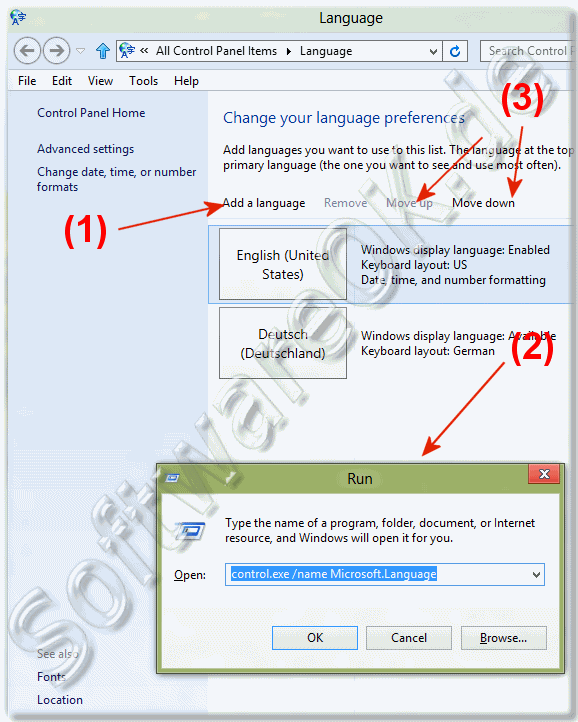 (Image-1) Remove, Add and change Windows-8 and 8.1 languages! 2.) Set a primary language as the display language in Win 8.1 and Eight! With Windows 8, it is enough to move the language you want to use to the top of the list and simply log out of the Windows 8 computer, or reboot the PC. Then comes the request to log out of the Windows 8.1 PC. But you do not have to do that right away. The language change, however, takes place only after the new application on the Windows 8 PC (Logout / Login)! (Image-2) Primary languages on Windows-8.1 and 10! * Choose the language, that you want to see most often in Windows and in the apps you use. * Switch between the languages you use to type. For Windows 8, you'll be able to add and type in the languages that were in Windows 7. You might also be able to download a language pack in English, Arabic, Catalan, Chinese (Simplified), Chinese (Traditional, Taiwan), French, German, Japanese, Korean, Portuguese (Brazil), Russian, Spanish, Swedish and Turkish (depending on your region). First, you have to add the languages you want to use to your list. You might have to download and install a language pack for some languages to work on your PC. If you need a language pack, you'll see available for download next to the language name in the language list. Windows-8 - FAQ-33: How can i add or change languages in Windows-8 and Win 8.1? How can i switch from english to spanish in windows 8.1 or win 8? Windows 8.1 or win 8 enterprise x86 language pack traditional chinese? How to change windows 8.1 language from german to english? I bought a computer with sweden language how can i change it to english? How to change switch keyboard layout between multi languages by command line? How to change language in windows 8.1 from swedish to english? How to change language to english in windows 8.1 and Windows 8.1 or win 8? How to change language of start menu in windows 8.1 hindi to english? How to I restore my Start Menu on Windows 8.1 from Chinese to English? Can I convert windows 8.1 in Portuguese to English? How to change default language from English to Chinese on windows 8.1? How to change language in windows 8.1 pro portugues to english? How to change the computer's language german to english windows 8.1? Change computer language from german to english windows 8.1 or win 8? How to change a language on windows 8.1 brazil to english? How to change configuration spanish language to english in windows 8.1? How to display taiwan traditional chinese language in windows 8.1? Can you change the language on windows 8.1? Window 8.1 or win 8 other language can be installed as english? How to add malayalam language in windows 8.1? System language often goes to arabic in windows 8.1 what is the problem ? How to download chinese taiwan language windows 8.1? Display language arabic for windows 8.1 singal language? How to add switch language to notifications windows 8.1 or win 8? How to change keyboard from english to arabic in windows 8.1? Windows 8.1 system language from arabic to english? How we can change Hindi language page in to English language window phone 8.1 or win 8? Can i install thai language on samsung omnia windows 7 phone? Windows 8.1 change language in romanian? Windows 8.1 is installed russian how to change in english? Hindows 8.1 change language from chinese to english? Windows 8.1 spanish language with english keyboard? How can i change my windows 8.1 from deutsche to english? How to change language from german to english on windows 8.1, windows 8.1 or win 8 how to change icons language? Remove romanian language windows 8.1? How to change language preferences in windows 8.1 in french to english? On screen keyboard change tamil language windows8.1? Windows 8.1 remove arabic language? Change windows 8.1 language french to english? Add english language pack in windows 8.1 or win 8 installation files? Free download Khmer language pack for windows 8.1 Enterprise? How to change your computer language to english windows 8.1? How to change my system language in hindi with window 8.1? Need to change windows 8.1 or win 8 to chinese? How to change language in windows 8.1? How to add language interface pack windows 8.1? How to turn of computer by c language programing for windows 8.1? Greek language pack for windows 8.1 download? The arabic language is not enabled in this version windows 8.1 or win 8? How to change english to korean language on windows server 2012? Keyboard Short cut of How to type yoruba language on computer system? Is it possible to translate german windows 8.1 or win 8 into english? Download windows 8.1 tamazight iso? How can ein toggle between german and urdu language in windows 2013? My windows 8.1 is spanish how change the language to english? Download multi dansk language pack for windows 8.1 32 bit? How to change windows 8.1 from hebrew to english? Windows 8.1 64 greek language pack download? How change or add other language in windows xp my computer doesn,t have farsi language? Convert my french version of windows 8.1 to english? Windows 8.1 add language pack command? How to change whole computer language from english to chinese window 8.1? How to change language switch key on windows 8.1 and Windows 8.1? Copy display & keyboard input languages, format & settings to all users in windows 8.1? How change the windows 8.1 interface from english to french? How to change system language from ru to en in windows 8.1? Windows 8.1 change turkish to english? How can i add russian language for keyboard for windows 8.1? How to change language in windows 8.1 from german to english? Change menus from irish to english in windows 8.1 or win 8? How to set language in windows 8.1 or win 8 from chinese to english? How to change keyboard from arabic to english window 8.1? How to change my computer from chinese to english windows 8.1? How to change french windows 8.1 to english? How to change windows 8.1 or win 8 language to english without cd? How to change language in windows 8.1 arabic to english? How to change windows 8.1 translate from english to spanish? How do i change my 'photo gallery' (currently german) software into english? Automatically set windows system keyboard layout to default windows 8.1? How to add traditional chinese pack for windows 8.1 pro upgrade? How to change language on windows 8.1 irish app? How to change the language on windows 8.1? Win8.1 or win 8 english cannot display chinese i have uncheck the font? Link download language chinese simple pack for windows 8.1? How to change language from chinese to english in windows 8.1? When installing windows 8.1 my installer screen is in spanish? How to change windows 8.1 or win 8 from chinese to english when start up? How to change windows 8.1 system language to english? How do i change the language on my computer wndows 8.1 or win 8? How to change from english to danish on the keyboard for windows 8.1? How to change russian language to english in windows 8.1 preview? How to change windows 8.1 or win 8 language to urdu? Can windows 8.1 chinese version key work in an english version? Change the language of my windows 8.1 or win 8 desktop from turkish to arabic? Can i install windows 8.1 pro to change my windows 8.1 language from chinese to English win x64? Aktivate keyboard tamazight latin, change windows 8.1 chinese to english? How to change windows 8.1 or win 8 bulgarian to english? Microsoft windows 8.1 bulgarian language pack download? How to change my windows 8.1 settings from japanese to english? How to change to arabic in windows 8.1? How to change language from portuguese to english windows 8.1 or win 8? How to add english language in windows 8.1 image x64? How to change windows 8.1 language? Instructions for changing Windows 8.1 from English to Spanish win x64? How can change the language on first screen of windows 8.1 installation? How to change windows 8.1 hindi to english? Change language windows 8.1 and 8.1 spanish to english? How to change windows 8.1 language from french to english? How to change between languages in window 8.1 x64? Change language from english to danish in windows 8.1? How to change windows 8.1 or win 8 language to english? How to change the language from german to english on windows 8.1? Change language from japanese to english in windows8.1 download? Windows 8.1 how to change keyboard from swedish to english? Windows 8.1 enterprice language pack dutch installeren vanaf dvd? How to change language in windows 8.1 from hindi to english? Help my windows 8.1 is in portuguese need to change to english? How can i change my windows 8.1 menu pc from french to english? Change language windows 8.1 key? Change language in win 8.1 or win 8 from russian to english? How to change windows 8.1 or win 8 russian? How to change swedish language to english on windows 8.1? How do i change from english to hebrew in windows 8.1? How do you make microsoft into spanish on windows 8.1? Change windows 8.1 logon language? I have windows 8.1. how do i change the language from spanish to english? Windows 8.1 hungarian display language pack download? How to change language arabic to english in windows 8.1 or win 8? How to change system language in windows 8.1 or win 8 from filipino to english? Change language on windows 8.1 from portugues to english? How to change urdu language to english in windows 8.1? How to change windows 8.1 or win 8 icon language? How to change the english language on windows 8.1 to italian? 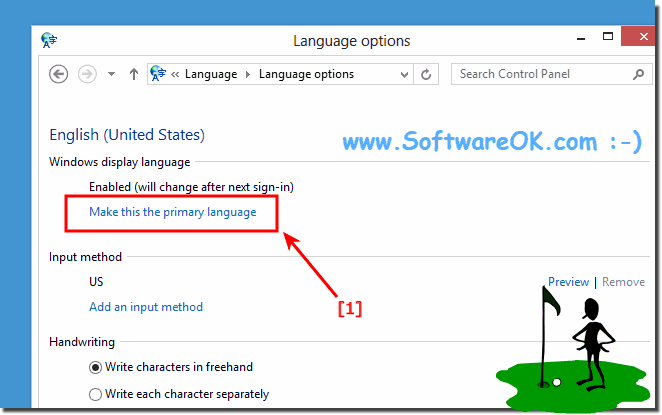 Step by step how to change region and language settings in windows 8.1? How to change interface hebrew to english on windows 8.1? How to add macedonian language and keyboard in windows 8.1 x64? Change windows 8.1 dutch to english? How to change computer language english to arabic window 8.1? Trun windows 8.1 to marathi? I have switched my windows 8.1 computer to spanish and can t get it back to english? How to switch windows 8.1 in thai language to english? Windows 8.1 start change to english? How to change my desktop and computer language to english windows 8.1? Windows8.1 download change language -preview -rtm? Now translate them into alanguage you know arabic tamazight or french?